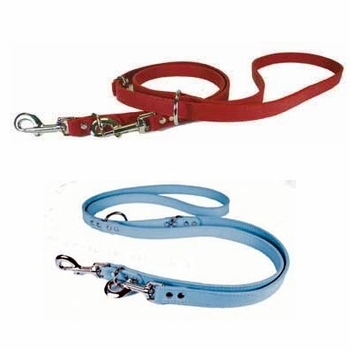 Our European style dog lead has six functions. This leather dog lead is made out of 2 ply leather 3/4 inch wide leather 2-Ply lead. This lead with nickel bolt snaps can be adjusted to a 43 inch lead, a 53 inch lead or a 6 foot lead. This lead can also be used as a two dog lead, an over the shoulder lead and portable tie-out. Our dog leash is available in our Signature Leather colors Black, Baby Blue, Emerald Green, Jade, Mandarin, Orange, Pink, Red and Yellow.